It was in 1943 that Parliament passed an act that recognised that many miners were been struck down with what the miners called “The Dust” (pneumoconiosis’s). The Government decided to encourage employers to give ex-miners employment. Leonard Lord had taken this to heart and decided that those (in this case South Wales miners) who had been cut down by this respiratory condition could still earn a wage. It was stated that in 1945 there were over 5,000 miners suffering from this disease. The plan was that they would build a Toy Pedal Car based on the current models. To keep the cost down, it would use metal off-cuts. It was Leonard Lord, Chairman of the Austin Motor Co who in April 1946 summoned Rod Phillips who was an Artist attached with the Post War Planning whose brief was to look into the future of how the factory would look in the Post War period. He was joined by Jim Blake who had joined him after serving in the war, (it was a government directive that for person who was employed before the war, his employer would have to offer them their old job back on returning to civilian life. Both Rod and Jim had no experience of body design and the tooling needed. This is where a third member Alf Ash joined the team who had the expertise. The team were given a disused workshop in South Works in which to set up a design office and experimental build. So it was down to looking at the specification. a) Suitable for children in the age range four to nine. b) Must be able to have room in the front for a smaller brother or sister. c) Bonnet and boot to open. So starting from the bottom, the first think was to look at what was the smallest tyres available. This turn out to be Dunlop 12 inch cord tyres which were fitted on 8 inch wheels. The body had to mirror the range of full size models with the alligator bonnets, chrome grilles along with the characteristic headlamps. Producing a full size car is easy as all the tools and processes are in place. The main problem, how do you produce a car for children, so it was necessary to take measurements of a child. Alf Ash was the only one of the team of three who had children, so his eight years child Marcia was measured that very night. From these measurements next day a full size 2D template was made. Now the engineering drawing could be worked on. Leonard Lord who started the ball rolling made frequent visits to the workshop to see how things were progressing. He often made suggestions which were not always taken up. 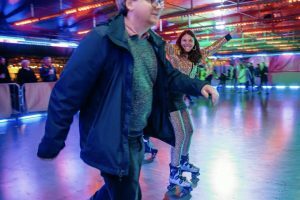 The launch date which had been planned for the Austin Progress Convention in June was getting closer, so it was decided that more staff were needed. This hole was plugged when two sheet-metal workers joined the team. The next thing was to design the facia, which had two dials, one the speedometer and the other split into three, Fuel, Oil pressure and Ammeter. An engraved plate said ‘This Car was built In The Austin Works By Disabled Men.’ This statement was incorrect as the cars would not be made at Longbridge. The seats were constructed on a plywood frame to which springs were attached. This was then covered by brown leather-cloth then the full length pleats were stuffed with horse hair. This work was carried out in the trim shop. Various other items were needed before the Pedal Car was ready to show to the public. A final coat of deep maroon paint was applied, a colour suggested by George Harriman. The next stage was to take the official works photographs, so the services of Alf’s daughter Marcia was needed yet again. I referred to the Austin Progress Convention earlier, this was a mile stone in the history of The Austin Motor Company celebrating the One Million Car (Austin 16) produced at Longbridge, the date 25 June 1946. As Leonard Lord was coming to the end of his speech about the achievements made by the company over the 41 years, he said “ I have a little surprise”, where upon he unveiled JOY 1 and then went on to explain to the guests where they would be made. So now it was on to the next prototype, JOY 2, this had to be made a lot lighter and be capable of being manufactured. Various changes were made, the main one was to improve the pedal system, by converting from bicycle motion to the forward backward system. With these changes made, the car was loaned out to management families to see how it would cope with the real world of children. The next chapter was to look at a complete change of direction. 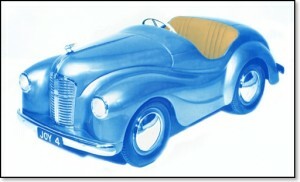 Jim Blake decided it would be nice to build a model based on the pre-war Twin-Cam racers, so from memory (no pictures available) the project was started and called Joy III. A lot of the mechanical components could be used, the wheels were the same, but instead of the large hub caps a Austin 8 petrol filler cap was used. As it was a single-seater it was necessary to reduce both track measurements, with the rear shorter than the front. It was finished in white with red wheels and trim and brown leather straps holding the engine cover in place, a decal displaying the number 3 giving it a racing image and also showing that it was the third prototype made. It was at this junction that the team moved from South Works to East Works, known to most of the workforce as the Aero Factory, into a new workshop which they christened Joy Car Department East Works. It was around this point that George Harriman, Works Manager asked Jim to take JOY III down to Selfridges in London to find out first hand if they would be willing to sell them. Unknown to the team the Austin Experimental Department had been given the task of producing a wooden mock up of a pedal car, using the rear end of JOY 1. The front end would be based on the A40 Devon which had not been announced yet. Jim’s first reactions on seeing the model, “was we will never sell that, it’s a monster”. It was time to start on the next phase, JOY IV which would have a front end like the new A40 Devon. This meant that they needed access to the full size drawings, which were not forthcoming, but were allowed drawings of the Devon grille. Although having seen the full size prototype, it was a case of memorising what they saw and transferring it on to the JOY IV. Soon it was time to show it to management, so an appointment with George Harriman was arranged. The unveiling ceremony was well received, its metallic blue body must have looked quite stunning along with the light fawn leather trim. Leonard Lord had got his concept made, so the small team was disbanded and no further prototypes were made. Jim Blaikie job now was to get new members for this team who could turn the two prototypes into a production model. The first task was to break down the body into separate panels that could be pressed out and then spot welded together. It was now that tooling and production of JOY III & JOY IV had to take place. It was around this time it was decided to call JOY III by the name Pathfinder and JOY IV would now be called JOY 40, this was soon changed to J40, with the J standing for Junior. The tooling was ordered for both models, it was then that various supplier’s, such as Dunlop and Lucas were asked to quote. One interesting contract was with Champion to supply sparking plugs which were actually faulty, so they probably came free. Every item would have to receive a part number, with some parts common to both models, like wheels and tyres. Although the original idea was to use up scrap sheet metal from Longbridge, this was only possible for small parts, the larger panels would be produced from fresh steel strip. The Government were willing to pay for a new factory, so it was decided to build the factory at Bargoed in Wales. To set the factory up second hand presses a total of nine were send down from Longbridge. The Body Sides needed a larger capacity press and so these panels were pressed in West Works Longbridge. Whilst this was going on the prototype team were disbanded, each one going back to their original jobs, Jim Blaikie actually leaving the Company in the early part of 1949. The factory in Bargoed was starting to take shape, and covered an area of 24,500 sq ft. This included a production area along with stores, offices and canteen. Although the Government funded the factory through the Board of Trade, Austin still had to pay rates, but this was reduced to 50% because only disabled staff were being employed on the production side. It was decided to get the plant up and running by Christmas 1948, in fact things were slipping badly and the factory was not finished till January 1949, with a manager installed and various staff from Longbridge arriving to install the necessary equipment. One interesting piece of new equipment was a process supplied by Carrier Engineering for the preparation prior to painting of the bodies. The process was called Rotodip which the company were hoping to get Austin to installed at Longbridge. The process involves putting the welded body on to a shaft that rotates as it goes through baths of metal preparation chemicals. The management at Longbridge must have been impressed as the process was later installed in West Works. One of the men who came from Longbridge at the start of the project is factory foreman, Mr T Gilbert who had been a sheet-metal worker in West Works. ‘It’s a great thing for these men to have a job. I’ve had men here who had been unemployed for five or six years. This place does a lot for their morale. None of them know anything about the work here when they arrive, but they are keen to learn, settle down quickly and do a very good job.’ In the beginning some 40 or 50 men started production and by early 1951 this had almost doubled. An up to-date medical centre was essential for the work force who would be employed, and staffed with a nurse and a part time Doctor. Twice a year the hospital in Cardiff would send a team along with a mobile X-Ray machine, to check on the workforce. It was decided in the early stages to make the Pathfinder version first, the main reason for this is that the main body was only two pressings, and these were being made at Longbridge. With less parts than the saloon version it was easier to bring it out first. The first public advert for the cars was by Selfridges in June 1949 although the company had contacted their dealers in mid May stating that “Delivery of Pathfinders will commence almost immediately, and the ‘Joy Roadster’ will be in production in about three months time.” Supplies were slowly being built up, ready for the official opening of the Factory in July 1949. The press were quite intrigued by the cars and gave the company much valuable publicity, although I don’t think there were any free samples given away. It appears that the Pathfinder was joined by the Roadster at the end of 1949, which was just right for the Christmas period. The cost of the Pathfinder was £25. 4s with the Roadster at £20. Production figures for the two models are unknown, as no figures were kept before 1955. In the early years the workforce was around the 110 mark, but in 1953 suddenly increased to just under 150. From then on it rose nearly every year until it reached a peak in 1965 employing 514. The reason for this increase was that over the years the factory had the presses and welding equipment to produce other small components needed by other factories in the BMC empire. Parts such as rocker covers, timing covers and number plates were the main items. The miners having worked in different pits, were now doing work that meant learning new skills. It must have been quite alien working in a factory, if you had only ever worked in a mine. One thing that some found hard to except were the hours starting at 8 am and finishing at 5 pm, because they were used to working from 6 am to 2 pm. It was on the 12 January 1962 when disaster hit the factory, the night shift around 10pm were aware of the smell of gas and reported it to the foreman. Minutes later there was a loud bang and the whole roof was blown off in the paint section. A temporary partition was erected closing off the paint section so that the rest of the factory could continue. Although the workforce were shaken no injuries were recorded, and everyone carried on, as there were orders to get out even though it was very cold. In late 1962 an additional factory unit was built to produce the door pockets for Mini and 1100 models. But in 1971 it was decided to close it down because the glue been used was affecting the health of the workers. 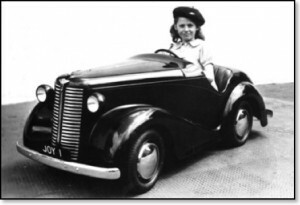 On the 15 September 1971 the last of the Joy Cars were made, all of them going to UK customers. At this point the production total from 1955 to 1971 was 32,098. 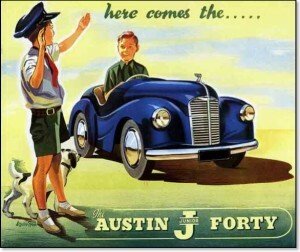 It is believed that the figure from 1949 to 1955 was about 1,500 Joy 40 and over 3,100 Pathfinders. As stated earlier, the Pathfinders were the first to go into production. The main components were the body, trim, front and rear axles, pedal assemblies and wheels and tyres. With the Pathfinder it only had two main pressings which were supplied from Longbridge. The pressings were spot welded together along with the facia and seat panels. As you can see from the picture below, after having a pre-treatment via the Rotodip and primer it passed to the paint spray booth. It would be hand sprayed and as can be seen in the picture the bonnet travelled separately. They were available in Cream with Red Trim.